After such an epic winter in the Sierra, I figured that the spring corn skiing season would be equally as fab. What little we have had has been fun, but it keeps being interrupted by a return to winter. We had heard about the possibility of weather moving in yesterday, but decided to go ahead with Operation Eastern Sierra anyway. Mango margaritas were taunting me loudly, and after a long week I needed to get outta Dodge. 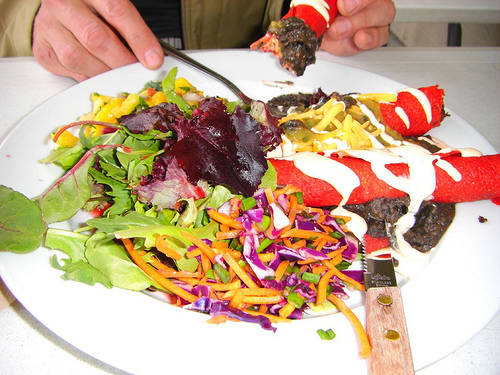 We met our friend Fred at the Whoa Nellie Deli on Friday night to discuss Saturday plans over fish tacos and jambalaya. 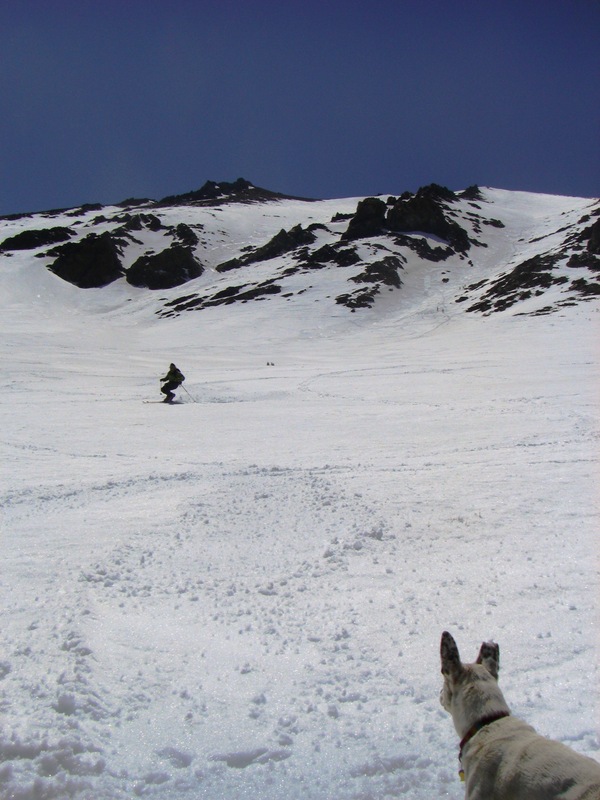 Fred really wanted to hit the Cocaine Chute, a steeper line near the Dana Plateau. 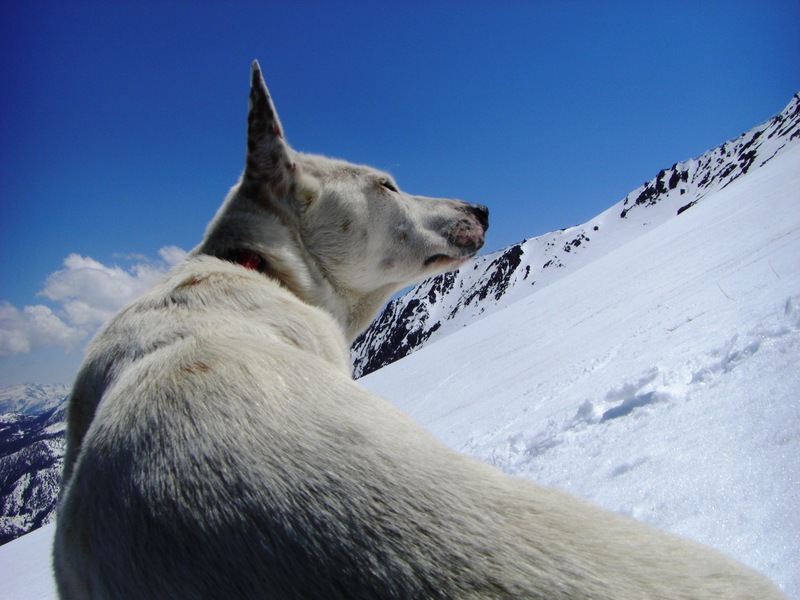 I wasn’t into boot-packing up a chute (ski boot issues make that the equivalent of stabbing needles in my eye), and decided to take the dog and head to the less extreme terrain of the lower apron of Mt. Wood. As luck would have it, a friend of mine pulled in right behind me not moments after I’d parked, so Soleil & I joined him and his friends. This made route-finding on the initial climb dead easy, since all I had to do was follow. The climb up is pretty direct (read: up), and once we reached the lower apron of Mt. Wood it was literally a straight line up. As my friend & his pals continued up the steep, icy bootpack to the summit (whose steep angle my camera couldn’t capture), the dog & I lapped the lower slopes, which were corning up nicely. Turns out the descent from the near top of Mt. Wood wasn’t as soft as hoped, due primarily to the cold east winds that had been gusting all morning. That said, it only about 1,000 feet out of their 4,000+ foot descent though, and the winds did ensure that the lower elevation snow didn’t get too sticky, even at 2.30 pm on our final descent. All of us milked the remaining few thousand feet of silky corn, including the dog, who had a few spectacular wipeouts as she tried to keep us with us. It was definitely one of her bigger days of the season, and she was pretty happy to get back to the truck. Truth be told, so was I. My ‘easy’ day ended up being about 8 hours with over 4,000 feet of vertical. And a lot more fun than I imagined. We had hoped to spend this past weekend huntin’ for corn snow up around Tioga Pass, but the forecasted precip did arrive, and came in wet enough to encourage us to hit Mammoth for some resort skiing instead. While we knew it would be a wet storm, we didn’t factor in the ridiculous winds that kept most of the mountain shut and made visibility optional. We skied anyway, but quit midday when goretex layers had become saturated, and headed to our digs at June Lake, where the weather was windy but not so wet. 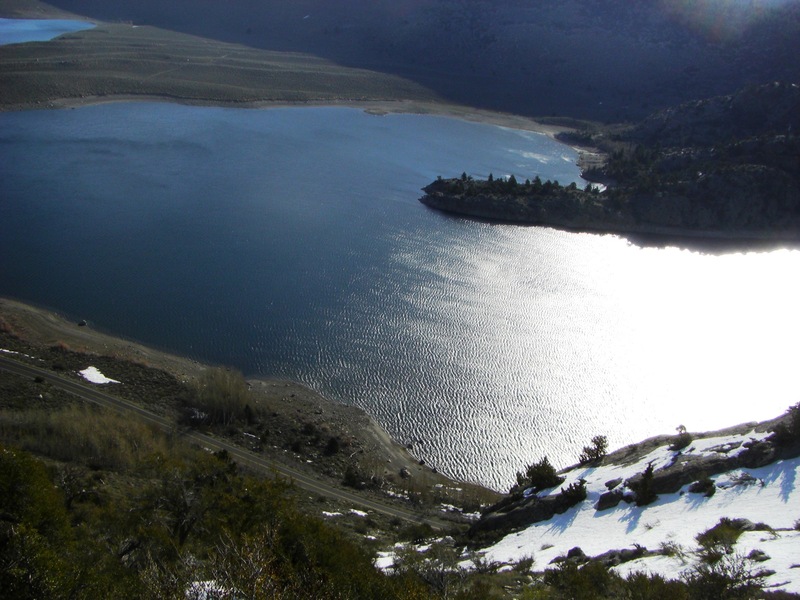 Since neither of us had really walked around the town of June Lake, we figured a faux-urban hike would be a way to see parts of the area we tend to overlook for the more exciting hiking trails of the nearby Ansel Adams Wilderness. 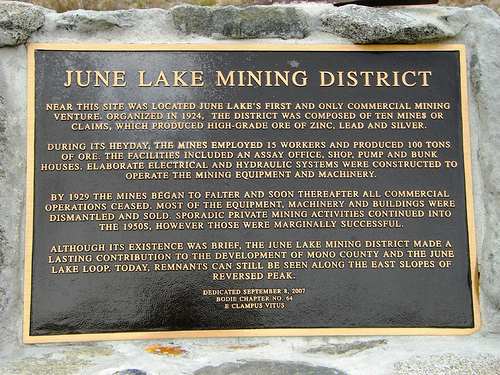 In doing so we discovered a bit of history – June Lake, like many other Eastern Sierra towns, had a mining history. 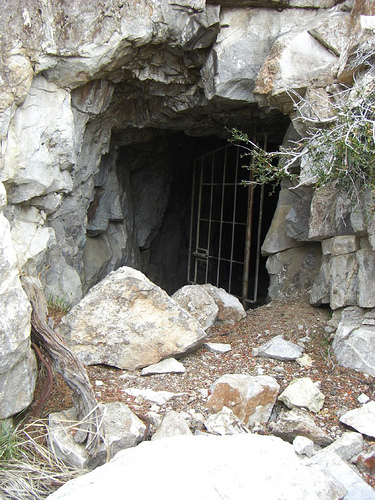 Its history was a mere 5 years (1924-29) but resulted in a fair bit of ore from the various shafts located in the slope above Gull Lake. Who knew? Coupled with the first pilgrimage of the season to the Whoa Nellie Deli, where we were rewarded with amazing vistas of clouds and the Sierra Wave along with our fish tacos and mango margaritas, it ended up being a lovely escape from Tahoe. It was only Monday last I looked. How did it become mid-September already? 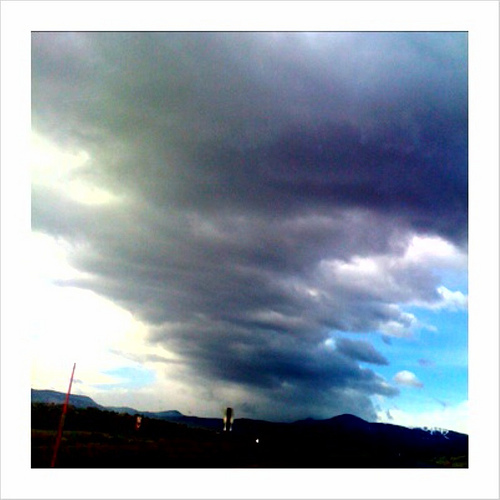 The wind from our Labor Day trip to Mammoth must have pushed the time by all the quicker. It’s quite versatile, that wind. Not only did it exfoliate my face with the help of the pumice that’s native to Mammoth, but it kept thing exciting at our hotel, the Tamarack Lodge, by rattling windows and trees and gusting to ridiculous speeds (I heard 95 mph on the local weather). Despite the unusual weather, it was refreshing to get out of Dodge for a weekend and enjoy some cooler temps, different scenery and see old friends. N had spent Saturday morning doing maintenance on the Ski Club Lodge (a keeping it real quonset hut perched on some prime Mammoth real estate), so we stole a few hours in the afternoon to do a short hike. 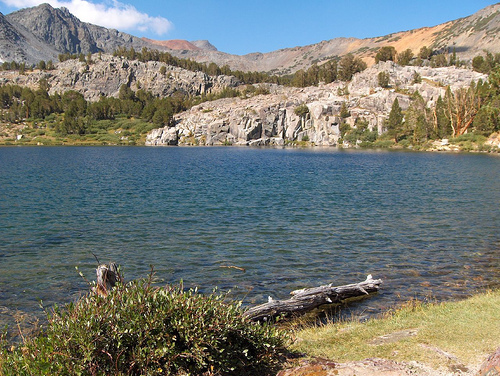 That meant Mammoth frontcountry, which is polluted with people, many of whom have no clue about hiking etiquette. N had words with some retards who insisted on cutting the trail, and the idiots acted contrite but continued to do so until he caught up with them again. 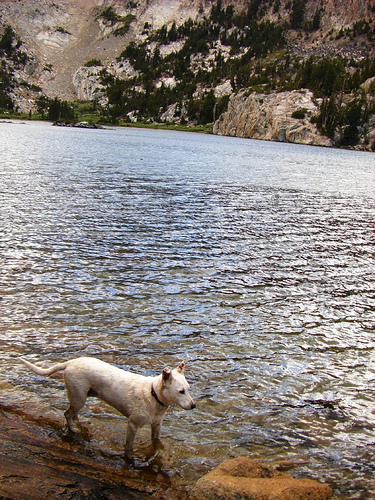 However, there was a lake within short distance which meant the dog could swim, so we suffered stupidity for her needs. She amused the various groups of Japanese tourists (there were many) who weren’t familiar with a dog prancing with a log. Most people just hike to and from the lake, but we continued another half hour up the trail to the Mammoth Crest, which is well worth it for the views. The best part of the hike was the descent – it took only 20 minutes to descend what took an hour to climb, and got us back to the Tamarack Lodge in time for cocktail hour. 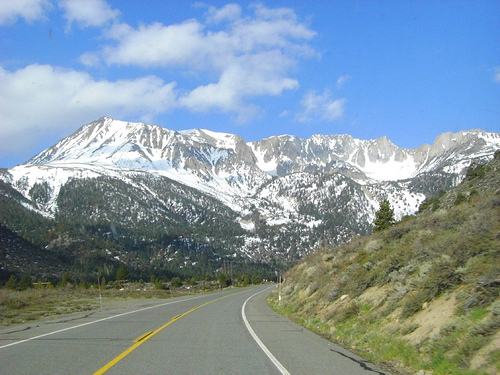 The east side of Tioga Pass road opened this week, allowing backcountry skier’s access to hundreds, nay, thousands of acres of high-altitude terrain. With this annual rite of spring comes the requisite stop or stops at the Whoa Nellie Deli, perhaps the best gas station cuisine to be had in California, if not the Western U.S. Thanks to a meeting change for N, we were able to get down there this weekend, and while the weather gods chased the sun away sooner than we expected today, we still found terrific corn snow off False White. And it’s hard to complain when you start the day out like this. The dog, as per usual, was thrilled to be out skiing, and freaked out with more vim than usual. 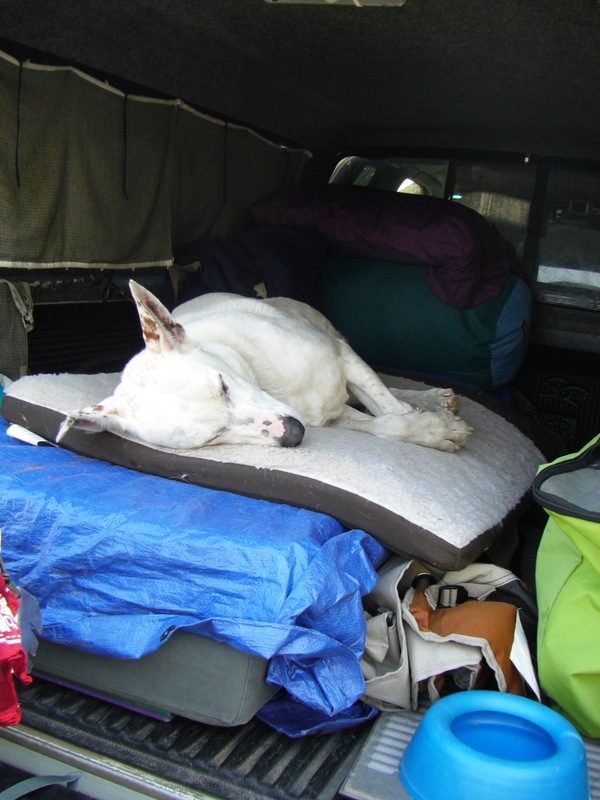 So it came as no surprise that she was eager to get back into her lair in the back of the truck afterward. Top off the morning with a stop at the Buckeye hot springs for a quick soak and it made for a great day in the Eastern Sierra. Despite sharing Mammoth Mountain with 80 trillion folks from Los Angeles this past weekend, we still managed to avoid crowds and find plenty of that glory wind buff snow that’s unique to the Eastern Sierra. We planned our trip to coincide with Mammoth Mountaineering’s annual Telebration event, where freeheelers and meadow skippers descend upon the mountain to demo skis, take free lessons, and celebrate their weird ski binding. 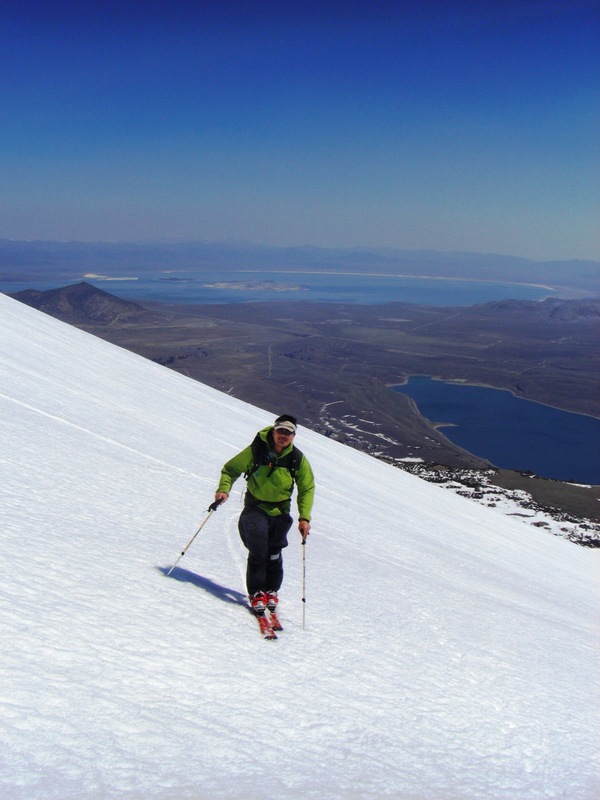 Both N and I tested skis, and he got himself onto a new boot/binding system – the Crispi EVO NTN. He was so enamored by it that he ended up buying a pair that night, which goes to show you that free demos do have their benefits. I tried out a number of women specific tele skis, primarily to serve as comparison against those that I have and will review for Telemarktips. I particularly liked the new G3 Luscious, if only because of the cool name and fun polka dot graphics that reminded me of my very first pair of telemark skis, Dynastar’s Fat Mollys. While the warming temperatures at Lake Tahoe had created spring conditions at lower elevations, Mammoth’s snow was still wintery (hooray for high elevation! ), and the winds buffed out a lot of the moguls, giving us a clean slate each morning. I didn’t let the lingering effects of my cold hinder my ski days, which some thought might not have been a wise choice, but I’d have to be hospital bound before I gave up a day (or 3) skiing at Mammoth. Overall a great weekend, even with the collective stupidity at level 11. But what can you expect when you’re sharing the mountain with half of Southern California? Today is environmental blog action day, a day where we bloggers are drawing attention to the environment through our posts. Since I’m cynical and don’t really see a viable solution to the mess we’ve created on this planet, I’m not one for solutions (don’t procreate? vote democrat? neuter your pets?). I just play outside a lot and talk about it. This weekend was no exception to my getting outside philosophy. With the faux in-laws in town, we headed down to June Lake for some good eatin’, fall-color watching and bonding with my mother and stepfather who drove up from LA to meet us. 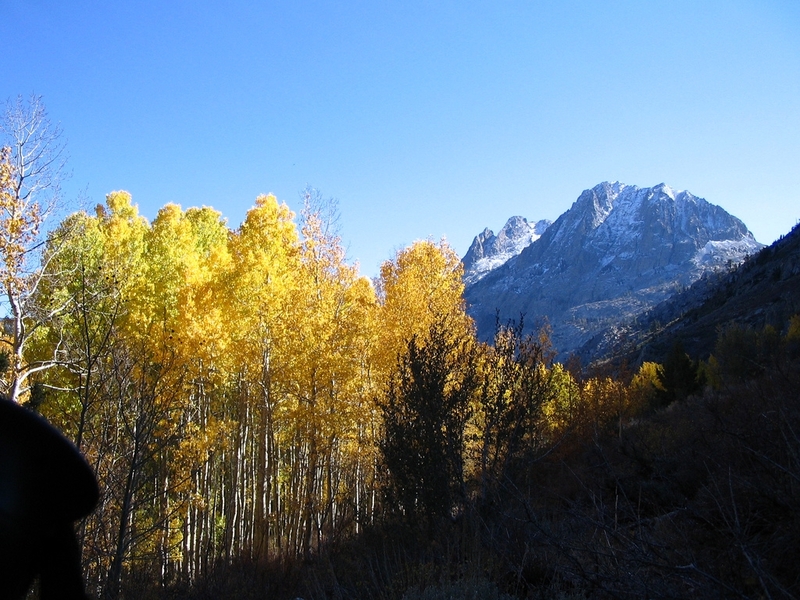 The Eastern Sierra is absolutely glorious at this time of year. Vivid colors, cool temps, and in the case of this weekend, a dusting of snow over the peaks made it all the more spectacular. 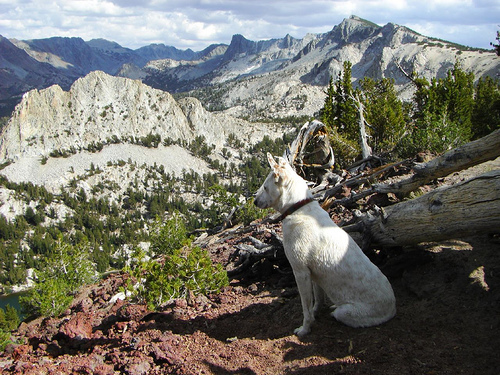 While N took his parents and my stepfather into Yosemite, my mom and I had dog duty, so we took the mutt for a hike in the Ansel Adams Wilderness via the Silver Lake trailhead. It was a 2600 foot climb to Gem Lake, and you can see how high you are for most of the trail, as it’s entirely above treeline. 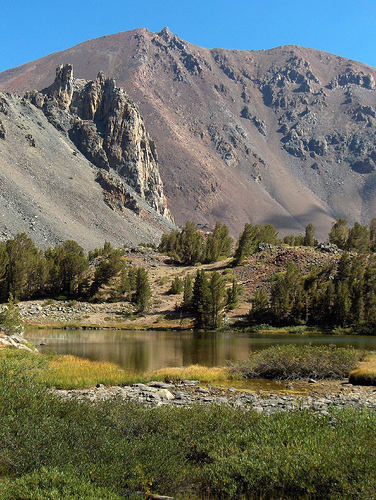 With big peaks above us and large lakes below, combined with the odd glimpse of Mono or June Lake, we were awed by the expansive views that the Eastern Sierra is renowned for. As happens in this part of the world, we encountered a few interesting characters on the hike back, including the South American guy who looked like a real junk-show, wearing a hard hat with headlamp and toting his possessions in various stuff sacks and handbags looped over his body. He must have been the one to drop his container of lighter fluid (?!) on the trail, which I promptly picked up to avoid encouraging stupidity in the backcountry. Even though fire danger is no longer extreme in this part of the world, campfires are verboten in wilderness areas, though many people blatantly ignore that rule. 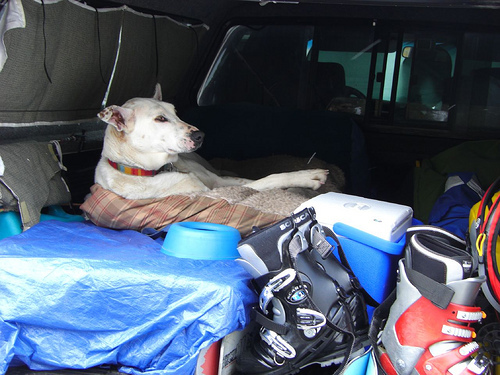 After thoroughly exhausting ourselves at Mammoth on Saturday – and neglecting the mutt, who spent the day lounging on her double mattress bed in the back of the truck – we felt a ‘moderate’ hike was in order on Sunday. 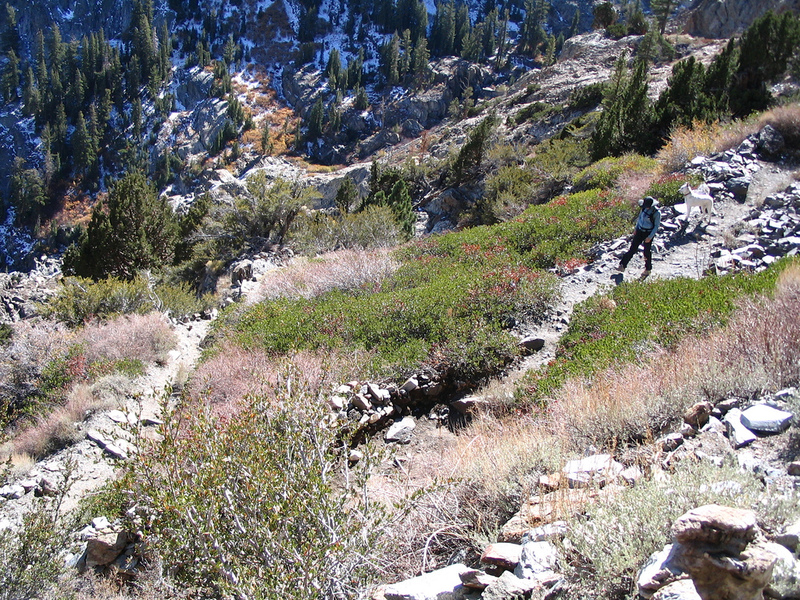 So we headed north to Virginia Lakes trailhead, located at a very cool 9,800 feet. It had been years since I last checked this trail out, and remembered lots of lakes, and a pass. While the pass is unnamed in our Tom Harrison map, the lakes are – Blue, Cooney and Frog(s)…among others further in. The trail itself provides a lot of bang for the buck. Pretty lakes? Check. Awesome vistas? Got those too. 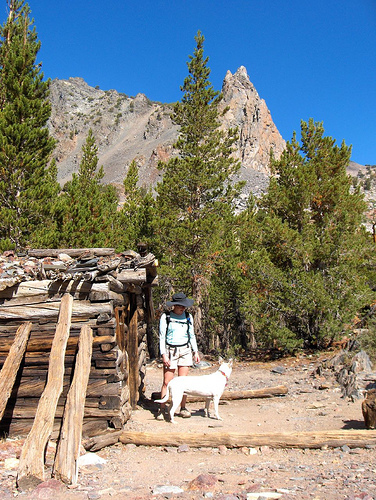 There’s even a random abandoned cabin on the trail whose provenance is curious – old mining place? Tired hiker? A bandit’s hideout? 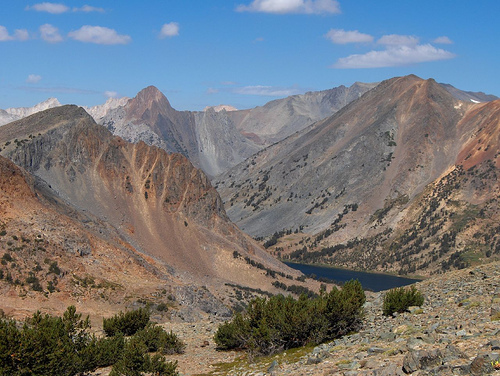 The pass-with-no-name quickly drops about 1,000 feet to a junction where you can either head up to Summit Lake or down to Hoover Lakes. Due to time we decided to head back, but we’re already thinking about coming back and doing it as a car shuttle, perhaps in the autumn when the leaves change.